All transactions are safe and secure with a reliable history in online purchasing behind each of our associates. Buy the Vampire Baseball Jerseys to own Twilight clothing and merchandise. Support Edward Cullen in this cool Vampire Baseball jersey. 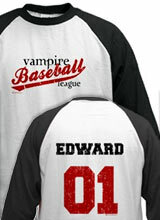 The front of the tee reads, "Vampire Baseball League," while the back displays the name "Edward," along with a large number "01" printed in red. Perfect for both male and female fans of Stephenie Meyer's Twilight books, this cool Twilight t-shirt is great for baseball games and breezy afternoons on the porch with a novel. Wear it when you play against the vampire James, a non-vegetarian vampire who is relentless and hunts humans for sport. With this jersey on, everyone will know you're rooting for Team Edward. In addition to the Vampire Baseball Jerseys above, browse the Twilight Clothing Gallery for more apparel like men's and women's clothes, kids shirts or hoodies.